De winkel voor Rhino software & plugins. Maak gebruik van onze jarenlange expertise. Huur een expert in voor een project, consult of dienst. This trainig module is sold without support. When desired, please click here and purchase support separately. Initial Design/ Sales Impressions/ Hull Optimization/ Final Design/ Fairing for Production/ Reverse Engineering: Hull from GA, Lines-Plan, point cloud or measurements. Every type of ship hull can be designed and modeled accurate and fair in Rhino with several techniques and strategies. Each strategy has its pros and cons depending on the type of ship hull and purpose of the 3d model of the ship hull. Most important factors are whether the strategy allows fast editing and easy fairing for a flexible workflow and accurate results. The Rapid Hull Modeling Methodology offers it all, for nearly every type of ship and yacht hull shape, which makes it so attractive and valuable. The Rapid Hull Modeling Methodology was originally developed by Bas Goris and Phil Shapiro more than 10 years ago. Since then it is further developed by RhinoCentre. 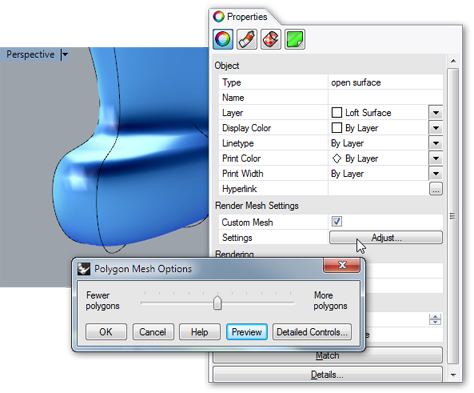 Most important is that the user defines the quality of the surfaces and not Rhino. Therefore proper training is crucial to avoid mistakes. Both double curved round bilge type of hulls as single curved (developable, multi chine) type of hulls can be modeled in Rhino. Control continuity from one surface to another surface (G0-G4). Intersections for shape analysis and lines drawings. Section curves can also be input for modeling frames and other stiffeners. Investigate hull examples of 6 ships, 4 yachts and 3 workboats. These hulls can also be used to kick-start your projects. This is a pure Rhino 5 or Rhino 6 software training. Plugins are not required. Mandatory prerequisites for this training: R1L1 – Rhino Level 1 training. After purchasing this module, it will be accessible and available for twelve months. It is possible to save the texts and images of the training module as a reference book. The instructional movies will not be available anymore when the access period ends. By purchasing this product, one person is allowed to follow this training. This means that, for example, a colleague should also purchase this training. We trust you in this and ask you to respect our efforts and investment in developing this training for you. Down below, you can see a small part of the online training to give you an idea what you can expect. First, every exercise is explained with a movie. After that, below the movie, the exercise is written out step by step so you can practice yourself. You also receive tips, cautions and notes to understand better what you do and learn more than is explained in the exercises. 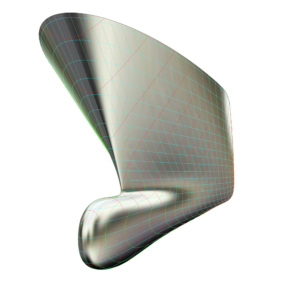 Surfaces in Rhino are described with NURBS mathematics. However graphics cards can only show the NURBS surfaces in wireframe display. To show the surfaces in shaded or rendered display Rhino generates automatically a so called ‘render mesh’ for each surface with a default smoothness. This explains that sometimes the edge curves of a surface show smooth and accurate but the surface itself shows rough and ugly. Especially during fairing with the Glossy for Fairing display it is important to have a smooth render mesh. 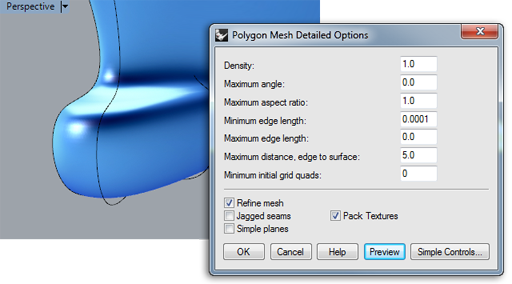 In the Object Properties menu select the checkbox for a Custom Mesh (Fig. 62). Click Preview again. The mesh faces distribution is much more refined now. Press OK to accept these settings and examine the display quality of the surface. It is important to understand that the more refined the Display Mesh is, the larger the file size will become as each Mesh face has to be described. Furthermore editing the shape of the hull is slower with a detailed render mesh as it has to be recomputed over and over again. On the other hand a sufficient level of detail of a render mesh is necessary to be able to examine the surface smoothness. Finding the proper balance here is very important. RhinoCentre voor Rhino Software is een kennisinstituut voor gebruikers van Rhinoceros 3D ontwerp software. RhinoCentre is een wereldleider in het toepassen van Rhinoceros.